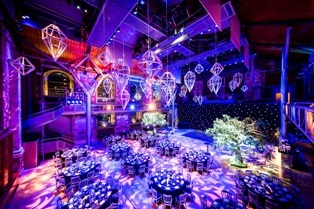 LSO St Luke’s, the Grade I listed events venue located on London’s Old Street, has unveiled its illuminating Christmas packages for the 2018 festive period. This year, guests will be dazzled with stunning lighting and flawless audio managed masterfully by LSO St Luke’s expert in-house AV team before enjoying a selection of mouth-watering dishes and finally dancing the night away on the LED dancefloor as the DJ takes to the decks. The all-inclusive package will create a striking setting in which to celebrate the festive season, all set to the enchanting backdrop of LSO St Luke’s original 18th Century interiors and panoramic windows, enhanced with the elegant decoration of mirrors and lights. LSO St Luke’s dedicated Christmas caterers, Moving Venue, will once again be bringing their award-winning catering to proceedings with a range of international cuisines, dining styles and bespoke cocktails on offer. Organisers can select from a series of dedicated bowl food, canapé and food station menus as well as more traditional sit-down dinners for up to 220 guests. For more details and to book your Christmas package at LSO St Luke’s, please click here or contact the events team on 020 7566 2871.